The uniqueness of Metz, as compared to other contemporary French cities, is given by the solid historic background of the place, a background by force of which Metz has always been deemed rather strange from the general dash of a common French locality. The fact that Metz used to be, until the 20th century, an apple of discord between France and Germany was, eventually, a fruitful circumstance due to which nowadays Metz is, in fact, a rather balanced expression of two great cultures. Should the historic heritage of the place not entice the tourist interest, than, perhaps, the mild architectural display of the city consisting of yellow limestone and the surname of The Green City might. Or, on the other hand, the fact that plenty of generals and artists, both French and German, were born in Metz, of which Paul Verlaine should be noted, might encourage a tourist venture in the current capital of the Lorraine region. Metz started off, historically speaking, as a significant settlement inhabited by the Celts, being the capital of the Celtic Mediomatrici, when its name, that is, Divodurum, was literally translated as the town at the holy mountain. Under Roman rule, it was considered one of the most important towns in Gallia, which thrived on the wine export. Prior to Franks dominion over the place (which began in the 5th century), it was conquered by Attila. During the 9th century, is was famous for its flourishing cultural and artistic life. However, it was not until the Peace of Westphalia (the 17th century) that the city became, for the first time, a part of France. As a historic curiosity, it should be mentioned that during the 19th century, in the Franco-Prussian War, philosopher Nietzsche took part as a German soldier. In 1871, by the Treaty of Frankfurt, Metz was annexed to Germany, whereas the Treaty of Versailles, in 1919, proclaimed the recovery of Metz as a French possession. Whether located in the center of Metz or rather at the outskirts of the city, hotels in Metz range from highly rated establishments to cheap sleeping venues. Thus, depending on the available budget and on the expectations, one might choose from luxury hotels to hostels, holiday cottages apartments for rent, or camping sites and bed & breakfast. The bottom line is accommodation is highly unlikely to become an issue for business travelers or for those traveling for pleasure. In terms of gastronomy, it should be mentioned that Francois Rabelais himself, during his stay in Metz, is said to have found his inspiration for Gargantua and Pantagruel. The fact becomes rapidly understandable once the tourist acquaints themselves with the local and regional cuisine, which is nothing but rich and extremely inviting, being replete with various meats. Thus, the bacon soup, the suckling pig in aspic, cured meat, the or the guiche lorraine are definitely worth sampling, whereas, in terms of dessert, the Paris-Metz cake and the Boulay macaroons are extremely popular. Several religious establishments should be ticked off once in Metz, the oldest of which is the St. Pierre aux Nonnains (built on the ruins of a Roman gymnasium). Others refer to the Templar Chapel, the Notre Dame de Metz Cathedral, the St. Etienne Cathedral, and to the St. Martin Church. Other landmarks are represented by the Serpenoise Gate and the German Gate (together forming the City Gates), the city walls, the Pompidou Center or the Theater and Opera House (the oldest establishment of this kind in the entire France). Metz hosts the largest hot air balloon festival in Europe biennially. An event of this kind is more than an invitation for the enthusiasts, but also a curiosity that may appeal to any possible future tourist. The Mirabelle Festival shows the gratitude of the inhabitants of Metz for this specific Lorraine plum. The Flea Markets regularly held in Metz are famous for being among the largest ones in France. The Metiz'Art Festival, the Summer Book Fair, the Water and Music Festival are worth attending to. 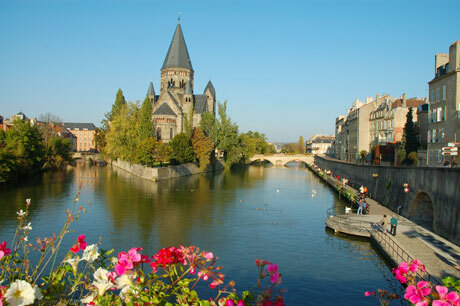 A stay in Metz might always be complemented by trips to other nearby destinations. Of these, Luxembourg is an exquisite call with plenty of tourist surprises waiting at each and every corner of the circuit. May it be the reputation Luxembourg has in the political, cultural, banking or technological life of the world or the spectacular culinary experiences it enables, Luxembourg is one destination no tourist should miss. Both business and leisure travelers are highly likely to find in Strasbourg an abundant range of opportunities to match their expectations. Of these, the culinary thrills they are bound to get in Strasbourg stand for one of the most inspired blend of French and German cuisine. Shopping tourism comes in many forms, but in Utrecht it is, some might opine, at its best. The largest indoor shopping center of Europe (Hoog Catharijne) enables such raving shopping sprees, but a stay in Utrecht might just as well be complemented by the sparkling nightlife opportunities the city makes available. The rich historic heritage mainly consisting of Roman and medieval vestiges recommend Trier as an inspired cultural tourism destination. Abundant in history as it is, Trier is also place of incredible liveliness. The Hague is far from being the gloomy city one might expect given its reputation in terms of legal arbitration, for instance. The Hague is the greenest city in the Netherlands and, most surprisingly, it also has the finest beaches in the entire country. For a taste of what architectural spectacle means in the Netherlands, tourists should head for Amsterdam. The old and the new in terms of architecture blend into a formula of surprising coherence in Amsterdam. But surely the tourist asset of the capital of the Netherlands does not come down to this aspect only, being complemented by countless other opportunities.